Remember the closing days of the 2012 presidential campaign when Mitt Romney ran that explosive ad suggesting Chrysler was going to stop building Jeeps in Ohio and move production to China? The one that got "Four Pinocchios" from the fact-checker at The Washington Post? The one Romney himself echoed in a speech he delivered near the Jeep plant in Ohio: "I saw a story today that one of the great manufacturers in this state, Jeep, now owned by the Italians, is thinking of moving all production to China." Right afterward, Meat Loaf performed. Anyway, that Jeep plant? It didn't move to China. It's going gangbusters. Demand for Jeeps is so high that Chrysler workers are clocking 60 hours a week and can't keep up. So according to the Toledo Blade, the company is hiring up to 1,000 part-time workers -- American workers, in Ohio -- so they can meet the demand. These workers are even going to get health insurance. "With record demand for the Jeep Wrangler and the launch of the new Jeep Cherokee last year, employees are regularly working 60 hours a week. And while employees generally like the extra pay that results from working overtime, such lengthy stretches can wear on workers, he said." In case you're wondering, hiring temp workers isn't a maneuver to deny regular workers their hours. "You've gotta remember, these people [the regular workers] are working 10 hours a day, six days a week," a UAW boss who helped negotiate the deal told the Blade. "It's very important to have the day off you want with your family." %VIRTUAL-article-sponsoredlinks%This is all great news for the workers and their families, for Ohio, and for Jeep. (Chrysler has hired 380 temp employees and converted 50 of them to full-time jobs, the Blade added.) If you happen to be waiting for a new Jeep Wrangler, I guess it's great news for you, too, since the new workers will allow the plant to start running its Wrangler assembly line on Saturdays. 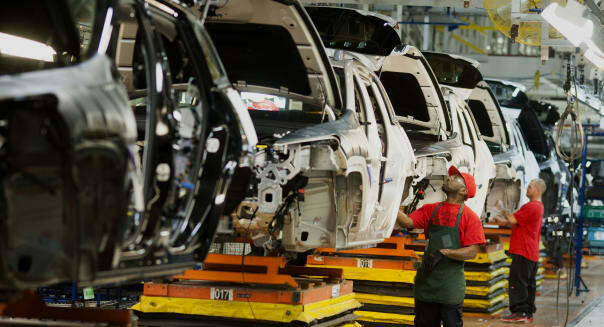 Call me petty, but what I think is greatest about this story is the line tucked down at the end -- the one mentioning that 15 percent of the Cherokees built at the Ohio plant are "destined for international markets." Joshua Green is senior national correspondent for Bloomberg Businessweek in Washington.